Thanks to the finance and stock trading apps, as you don’t require paid services for buying, selling and managing stock investments. 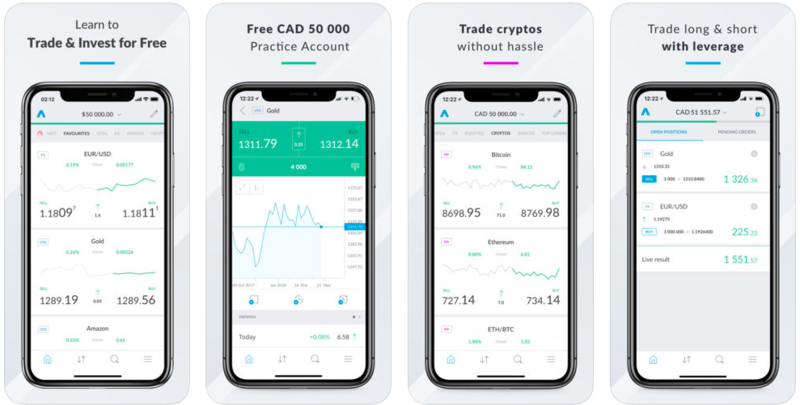 With simplified, sleek and organized stock trading apps, it is easy to enter your own stock trades, personalize your portfolio, invest in diverse options and manage all your payments in one single app. If you are willing to be a smart trader with efficient, effortless mobile phone system, you will need to learn and get trained. Here is the list of 13 best stock trading apps you will need in 2019 to perfect your real-time market trading. Built with simplified features, Toronto-Dominion Bank’s app is considered to be an ideal option for advanced trainers as well as beginners since it also includes training for investors. The app works on four different platforms and facilitates smooth external transactions. The app offers Educational accounts, specialty accounts, Retirement accounts, managed portfolios and margin trading. Recommended more for the first-time investors, Acorns is a great investment app for the user’s bank account and contains simple basic features. It has portfolio that reflects small percentage off your daily purchases made with credit/debit cards. 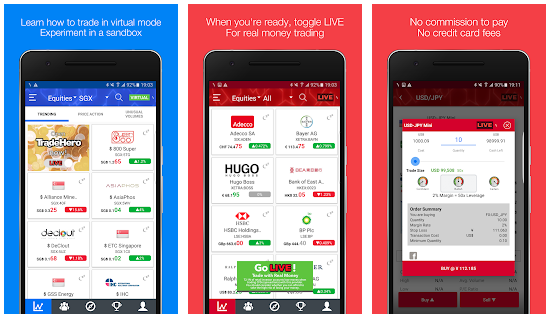 Like other apps, you can invest in the app for trading. It keeps the minor change from your purchase in your investment portfolio until it rounds up to $5. 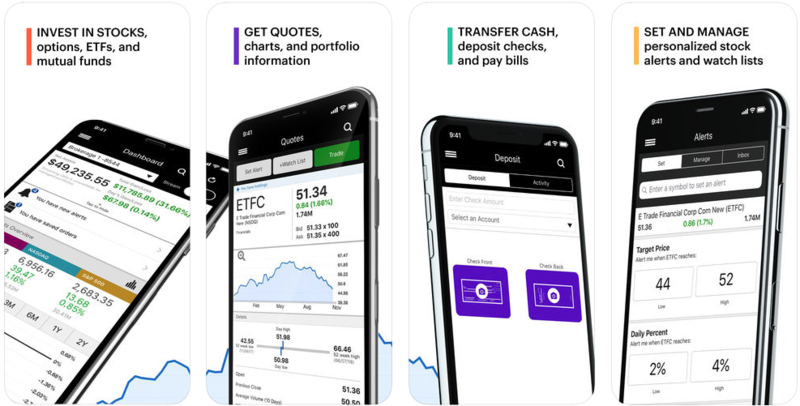 E*Trade Mobile is full-fledged stock trading and investment app that offers mature portfolio for skilled traders who expect immense profitability. Available for both mobile and web platforms, E-Trade is considered as a pioneer of online investment that launched its online trading and brokerage services via America Online and Compuserve. 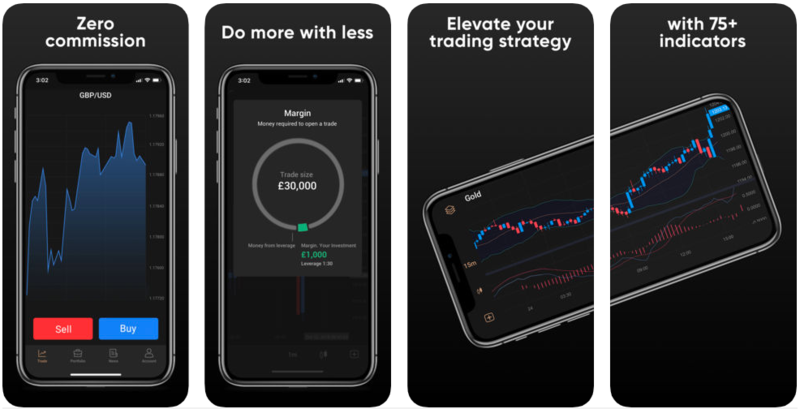 The long-standing in mobile trading, E-Trade is hugely equipped with powerful monitoring and analytics tools and has still retained the top position due to its advanced trading features. Capital.com is a glorious award-winning CFD stock trading app available across the globe that provides competitive broker service. What makes the app compelling and innovative is its sophisticated system powered by artificial intelligence. It is authorized and regulated by the Financial Conduct Authority (FRN 793714). Users can trade CFD of various assets and utilize its fully adjustable dashboard that incorporates user interests and preference. Robinhood is appreciated as another simple and best stock trading app that has all the basic elements. Robinhood has both standard and premium membership plans for advanced experience. As you sign up and deposit money into the platform, you can use the search bar to for an investment firm and monitor company’s stock fluctuations. If you have the beginner’sknowledge level but still wish to make wise investment and trading, Stash could help you. It is a stock trading app that primes you on how to build ETF portfolio. 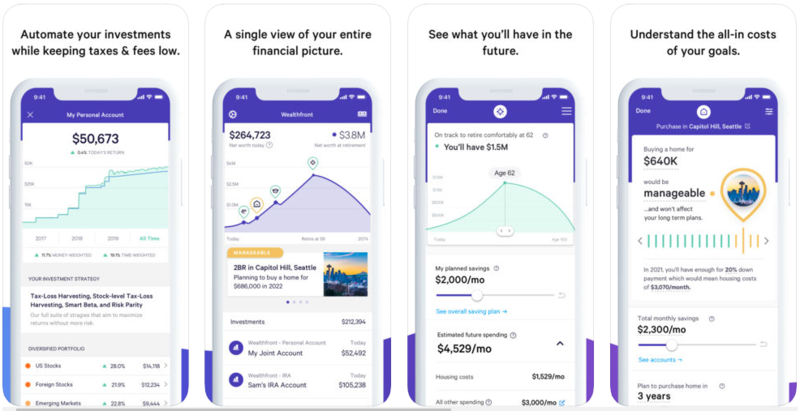 With Stash, you can invest as tiny as $5 and choose your investments while being educated on the same. Every time you access the account, the app shows you all the healthy tips and resources on improving your trading expertise. Your investments go into single stocks and ETFs and follow several investment themes as guided by the app’s investment coach. Though Stash does not directly manage your accounts, you can still link it to your bank account. With Stockpile, not only can you exchange stocks, but you can also gift single shares of stock or buy a fraction of shared stock at just 99-cent trade fee. With fractional trades, you can secure high-value stocks like Amazon, Google and Berkshire Hathaway without paying full for a share and only investing a portion of it with minimum lower value. The app suits families, kids, teens who wish to build a portfolio. Teens and kids will be encouraged to learn more about stock market and buy stocks or receive it as gift. Due to high risks and possibilities of loss, not everyone feels confident about putting real money in the market. TradeHero is a unique app that allows you to play stock market both on Web or smart phone for learning purpose. You can build a $100,000 portfolio with real-time stock market prices and zero financial risk. With TradeHero LIVE introduced in 2017, though, users can trade real money and virtual currency. 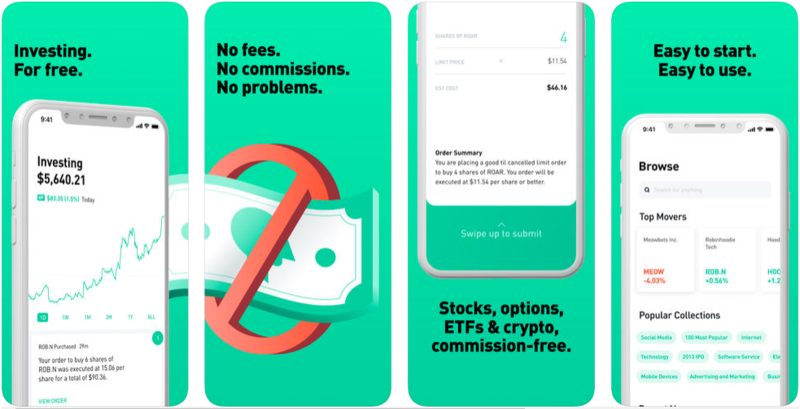 Fidelity is known as a low-commission stock trading app where users can many aspects of its interface appearance and functionality. While getting registered, you will be asked to complete a questionnaire that let the app learn your investment goals and approach. You can later adapt features that best suit your skill level. You can invest in ETFs and mutual funds as offered in Fidelity. When many stockbrokers create their own bank, getting an efficient app that has integrated banking and stock trading app becomes essential. 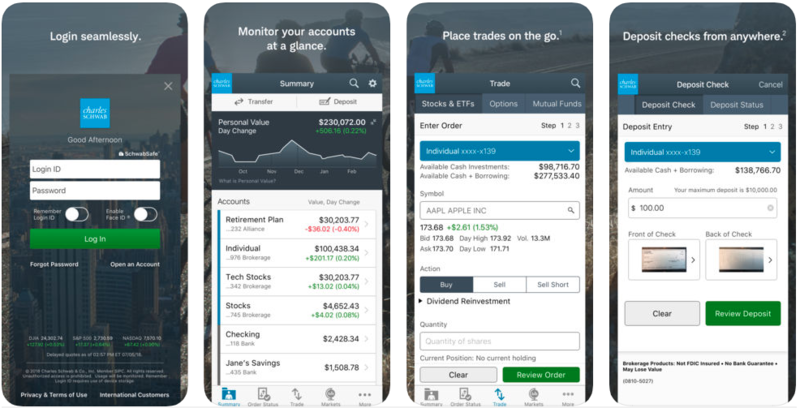 The Schwab mobile app brings all your Schwab investment and bank accounts in one mobile app for ease of management for fund transfer, check deposits, investment monitoring, stock trading and more. It has Schwab Investor Checking ATM card for International travelersat no extra fees. Pay bills with Schwab Bank Bill Pay. SigFig joins the list because of its ability to offer organized asset management and simplified portfolio. SigFig is highly suitable for seasoned traders as it comes with higher amount of minimum deposit value than low-minimum apps. The app synchronizes third-party accounts of users registered on TD Ameritrade, Fidelity or Charles Schwab. It shepherds users for portfolio monitoring and management, investment decisions and fees optimization. 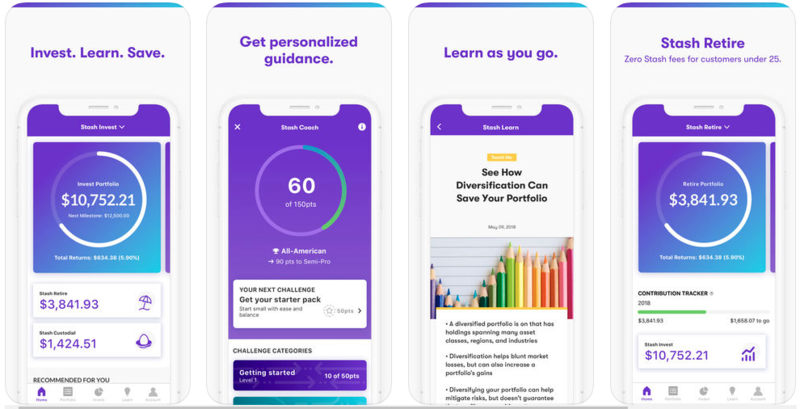 Another stock trading app you may try is WealthFront that enables automated investing with moderately low fees. Its integrated smart tool makes you a great strategy to achieve your goals and create diverse portfolio though you don’t have fractional shares here. When you are registered, it works as your expert adviser and helps set your goals, analyze risks and classify the ETFs investments. Trading 212 is another globally recognized user-friendly trading app for active traders that merges with all the major markets. It has educational programs and can also accessed from the web platform. You can start with a demo account to learn and get familiar with Trading 212 app features. It relies on a segregated tier-1 bank account for money management. 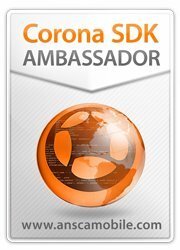 Unique educational content, automated trading, Trading signals, multiplatform support, chart view, market analysis One-click Execution are its outstanding features. These are 13 best stock trading apps in 2019, each offering unique platforms with power and smart capability for stock trading and investment options. They will help you learn, invest and reap profits on the go. 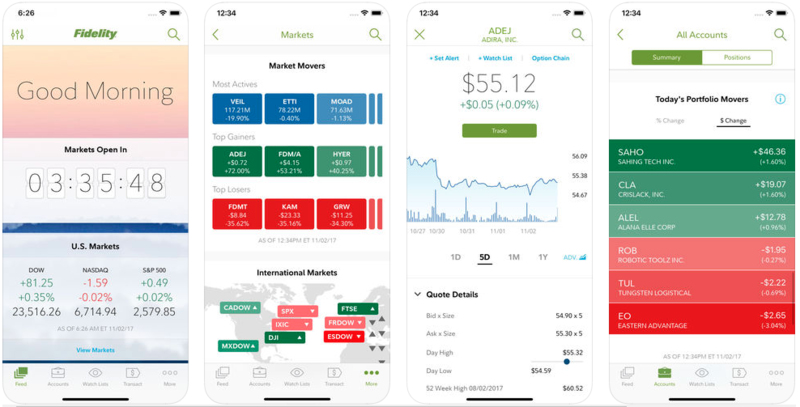 As 2019 approaches, these apps will help you keep up with evolving finance and trading market dynamics and succeed in your endeavors.